I still recall my trip to Bhutan (year 2016) as one of the most amazing and full-of-surprises kind of experience. I had reached this well-preserved haven with no preconceived notions and it had overwhelmed me with its sweet and charming revelations. Despite being a small country, it is absolutely pretty and photogenic everywhere. I mean I always knew it for its happiness quotient, for Tiger Nest (Takshang temple), for its architecture but what I discovered after going there was definitely beyond expectations. It is another world that not many people know of. While the architecture of Bhutan is something that I am still stuck on, the simplicity and the serenity of Bhutan too remains an unforgettable affair. While you are there, you will discover it for yourself! From sports to food to national animal, the Bhutanese are very different in their choices. While Archery happens to be the national sport of the dragon land, the use of cheese and chilies is dominant in all parts of Bhutan. The national dish is Ema Tashi, the national animal is Takin and I am sure the national drink is butter tea. Last but not the least, Bhutan is culturally rich. On my last day in Bhutan, I got an opportunity to see and appreciate some of the most interesting and old dance practices of the country. It was enjoyable as well insightful to learn about their origins too. Sharing a little about each of them in the post below. Since it is a welcome dance, it is usually performed at the beginning of any event or special occasion. The intention behind the dance is to welcome the guest of honor, to bring good luck to the day and announce a great start to the function where it is being done. Zhungdra is majorly about religious theme. The contents, lyrics and the performances make an offering to the Gods and Goddesses. 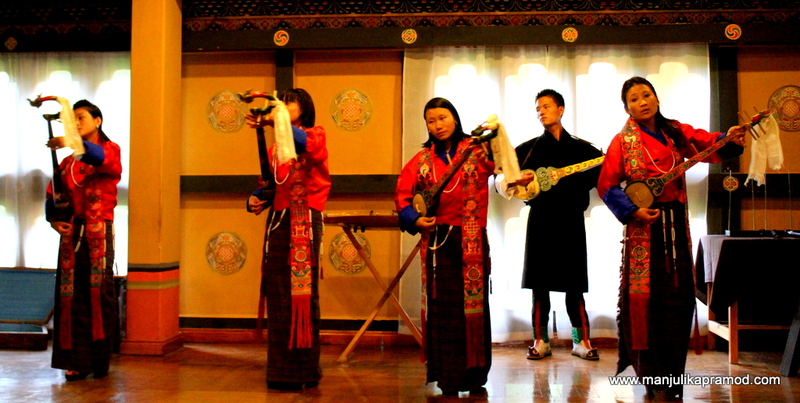 The oldest classical Bhutanese songs that are performed in Dzongs and monasteries is termed as Zhungdra. It is usually performed by women. A traditional attire and a rachu (a hand-woven Bhutanese scarf) makes for the look of the dancers. 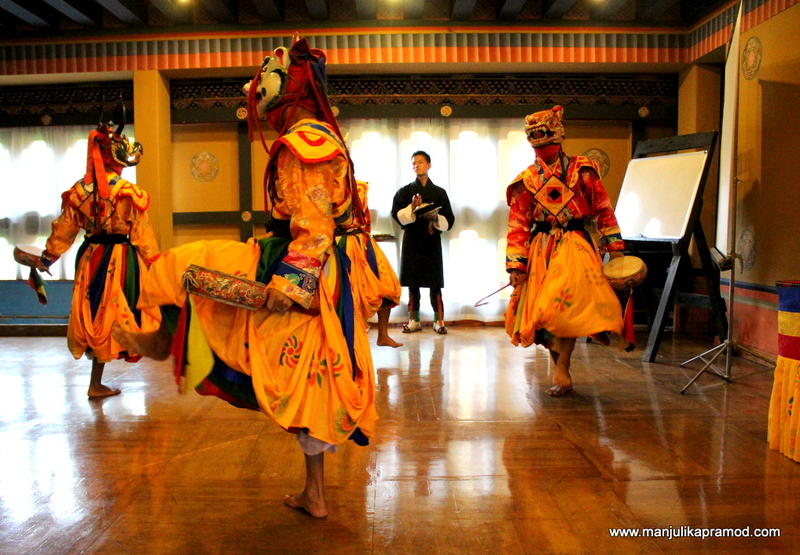 Mask dance is an important form in Bhutan and its festivals. A mask with a drum is one of the most popular mask dance. Since it was performed for the first time in the eastern Bhutan in Drametse, it is famously known after the place as Drametse Ngacham. The nomadic herders of Bhutan, living in the western high altitude perform this dance. Since they do not keep to a permanent place, Yak rearing is one of their main source of earning and living. Having originated from a village called Dorokha in Samtse district, it is one of the oldest dances. People who live in this valley are known as Dorokhapa and it is one of the oldest inhabitant in Bhutan. This one is performed during special occasions. This dance is the oldest dance ever performed in Bhutan. 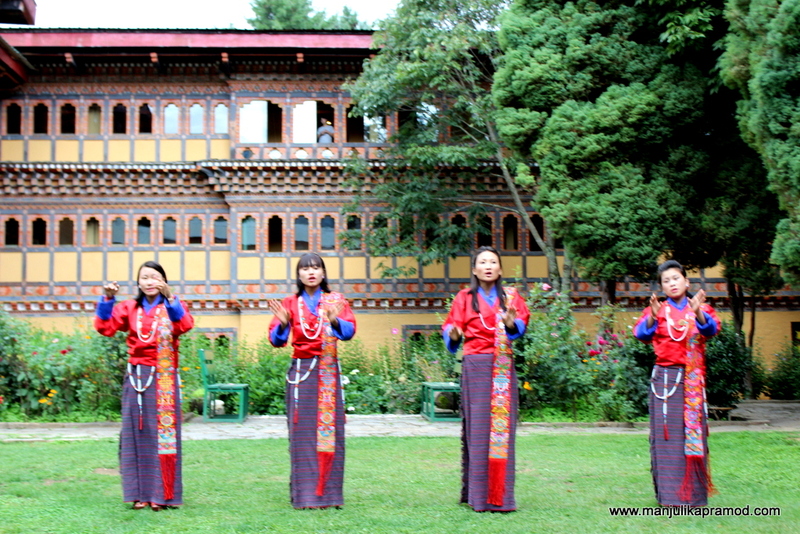 It is believed that this dance is done when the instrument is played by Drakini Lhamo Yangchenma (Goddess of music). It is believed that this instrument has been given by the goddess. The four dancers represent the four directions and pay their respect to the Drakini Goddess. Since Archery is the national game of Bhutan, this dance is a very significant one. While the teams play, some of the team members sing and dance and celebrate their points. This dance also depicts as to how archery was played in a traditional way. As the name suggests, this is supposed to be the end performance. It conveys a farewell feeling and everyone is invited to be a part of this kind of dance. It celebrates the event and wishes for more such meetings.